Here’s a quick project to decorate for the holidays! The featured design is the large stocking from OESD’s “Magic in the Air” embroidery collection #016, designed to fit the Jumbo Hoop for the BERNINA 830. If you don’t have a hoop large enough to fit this design, create a grouping from some of the smaller designs, such as the smaller stocking + the skating snowman. Choose a padded stool. Remove the seat from the legs. Embroider the large stocking from OESD’s “Magic in the Air” design collection #016 on black boiled wool in the Jumbo Hoop. 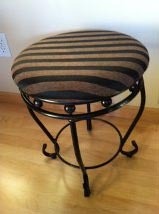 Trim your fabric to 3-4″ larger than your stool. 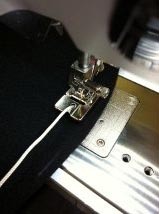 Using Bulky Overlock / Braiding Foot #12C, zigzag drapery cording around the perimeter of the circle. Cinch up cording to fit around the stool seat. Re-attach the seat to the legs of your stool. 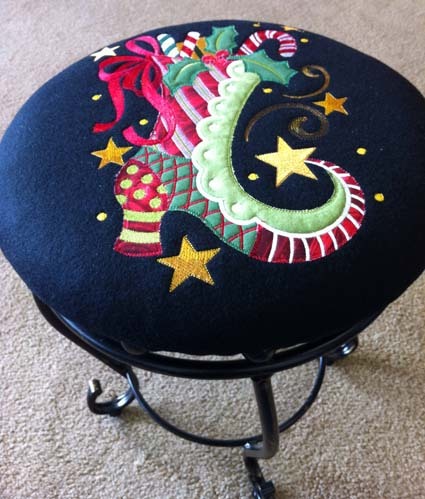 Instant Christmas stool for Santa!